This past week, Fall finally befell LA which means temperatures dropped below 70 degrees. Score! I can finally wear the fall and winter outfits I've been stockpiling since August! Why August? Because I'm a So Cal gal who in past years have been completely oblivious to the nippy and chilly temperatures that can strike even sunny LA. So, I usually get burned and end up shivering like a chihuahua during the colder months ignorantly walking around in maxi dresses and light cardigans, unprepared and unbundled. This year is going to be different. This year, I'm not going to feel like a cold-blooded reptilian. This year, I'm layering up. But in my fixation with sweaters and coats, I overlooked a key component in fall/winter dressing. Fall shoes! So, for the past few days I've been scouring the Macys.com’s fall shoes section overflowing my shopping cart with fall classics that are under $200 with most pairs falling under $100! 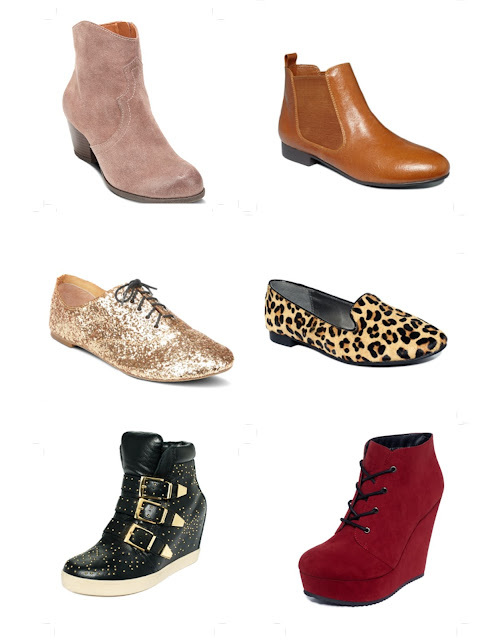 Here are my shoe picks that will keep me (and you!) looking fabulous, warm-blooded, and wallet happy fall after fall. I can't talk about fall shoes without spotlighting my favorite fall boots. They go with everything and keep an outfit looking polished and sophisticated. As for boot length, I simply love them all. I mean, everyone knows it's not about the length but how you style it. Flats are no longer my only option when I want to feel comfy and look stylish in "wear and walk everywhere" shoes. With so many shoeptions like the Chelsea boots and animal print smoking slippers, I don't think I've ever been as excited to keep my outfits low key casual this fall! Even though boots are fall's favorite child, let's not forget about fabulous stilettos and heels! There's absolutely nothing sexier than a blazer and jeans combo finished off with a pair of open toe or pointy toe heels. They're also the perfect shoes to take you from work to holiday parties. I adore your shoe picks!! Love the studded boots and the glitterized oxfords. So great for the upcoming holidays. Oh too many good ones to pick! Hi! My co-worker Kevin introduced me to your blog and I've been following it ever since. Love it!! I just realized I need more shoes! Out of all the shoes displayed I like the Marc Fisher pumps, they look the best is my opinion. More timeless and less trendy. Love them! Wow, all these shoes are absolutely gorgeous! I am loving all those boots – they are perfect for this season. Love these all! I need some new shoes! Que bonitos son todos, buena elección, gracias por tu visita. All the shoes are absolutely wonderful! Btw sweetie i´m your new follower! I loveit the boots! your blog is so cute I'm your new follower hope you can follow back! I´m so in love with those red wedges *_* Very faboulous!! Great selection! Have a wonderful weekend !! !Following your blog. Wow, so many great pairs! I love all the leopard!! great selection! :) I love shoes! I like the silver glitter shoes!! !